Introduction – and What is it? Those familiar with modern camera drones know that stable video is a result of having a stabilized gimbal – basically a cradle for a camera which keeps it level and vibration free. Many photographers desire a ground-based version of the same….for various reasons. Many videos feature a mixture of ground and aerial video. With the use of a handheld device such as the Osmo, both types of video will match more closely and have the “pro” look. In the spring of 2016 we took a look at the DJI Osmo, a 4K gimbal mounted hand-held camera. Although we enjoyed the system, the idea of using the smartphone that most of us have in our pockets was always appealing. At the time of our initial Osmo review we searched the market for a worthy smartphone gimbal – but were unable to find any that had US based support. With the recent release of the DJI Osmo Mobile, that problem appears to be solved. The Osmo Mobile is a very simple product – which I think is the whole idea behind it. It consists of a heavy-duty metal stabilizing gimbal mounted on a handheld grip w/internal battery. The system is driven by the same DJI Go app that runs other DJI equipment such as the Phantom Camera Drones. In the box you will find the Osmo itself, a soft case and a special USB to 1/8″ jack charging and upgrade cord. Initial preparation is as easy as installing the battery and plugging the 1/8″ jack into the Osmo Mobile and then into a (not included) USB charging wall jack. Charging time depends on the power of your USB wall jack, but should be from 90 minutes to 3 hours. Note – extra cost options include stand-alone battery chargers (single or multiple) and a higher capacity battery. Battery life is over 3 hours so many users are unlikely to need these options. Many popular smartphones will fit into the Osmo Mobile. A listing of the size requirements and other such questions are answered on the DJI Osmo Mobile FAQ page. Note – this assumes you already have the DJI Go App installed. If not, install it prior to starting. Also, be sure that Bluetooth is enabled and turned on as this is how the Osmo communicates with your device. Before using the Osmo, you must insert your smartphone with the Osmo powered off and balance it using the adjustable sliding gimbal arm. Full instructions are noted in the manual. Once manually balanced, the Osmo can be turned on and the DJI Go App opened. If all is well, you should be guided through a quick registration after which the Go App will recognize your Osmo Mobile and present you with the “Camera View” Screen. holding trigger locks gimbal into the current view. three taps on trigger changes camera view to “selfie” view (toward operator). Here is a short sample video with some clips from the DJI Osmo Mobile along with an iPhone 6s. Note that these are unprocessed and unedited. Much better shots can be had with some planning, experience and optional (or homemade) mounts. The original Osmo had some problems with the built-in mic – it tended to pick up a lot of the motor noise generated by the gimbal. DJI started including an extension mic to remedy this problem. 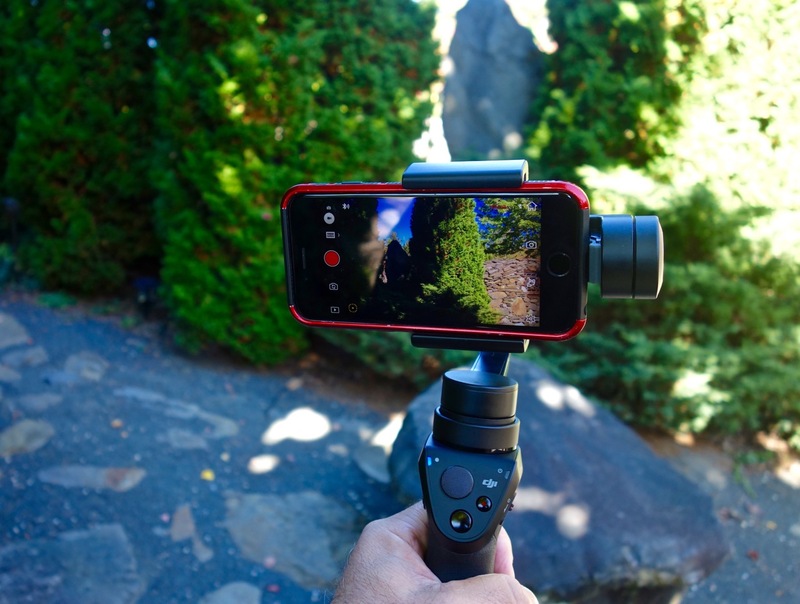 The DJI Osmo Mobile uses the smartphone mic – and doesn’t seem to pick up the motor noise. Some phones may allow for external microphone connections – but it’s hard to imagine why most consumers would need to add one as smartphone microphones are quite good. The DJI Go App represents years of development and therefore adds a lot to the value of all DJI products – including the Osmo Mobile. As an example, DJI offers the “Active Track” first introduced in the Phantom 4, in the Osmo Mobile. Draw a box around a moving object (person, pet, etc.) and the Osmo will attempt to follow your selection. Here are some video examples of Activetrack. Note – it’s far from perfect, but definitely allows following of objects and people in a way that – until now – was difficult to do. Your videos will almost instantly graduate from “can’t watch them” to “hey, that’s cool”. My first impressions are good – I like this as compared to my (now gone) Osmo. I don’t need another memory card and camera, so the ability to use my iPhone is a big plus. I suspect that most buyers of these handheld stabilizers are going to use them sparingly – those looking for semi-pro or prosumer will look at the higher end Osmos or Ronin (or other brands). There are inherent limitations in a product such as this – for example, your smartphone camera is not centered in the gimbal as a “custom” camera would be. The differences, however, to the average user are negligible. Getting the most out of the Osmo Mobile will take some experimentation with the various settings in the Go App. The new owner would be wise to spend 1/2 hour or more playing with the gimbal before taking it out to the field to capture their family, friends and local events. At $299 the value is there – the gimbal seems heavy duty (has to be to properly support heavier phones, etc.). 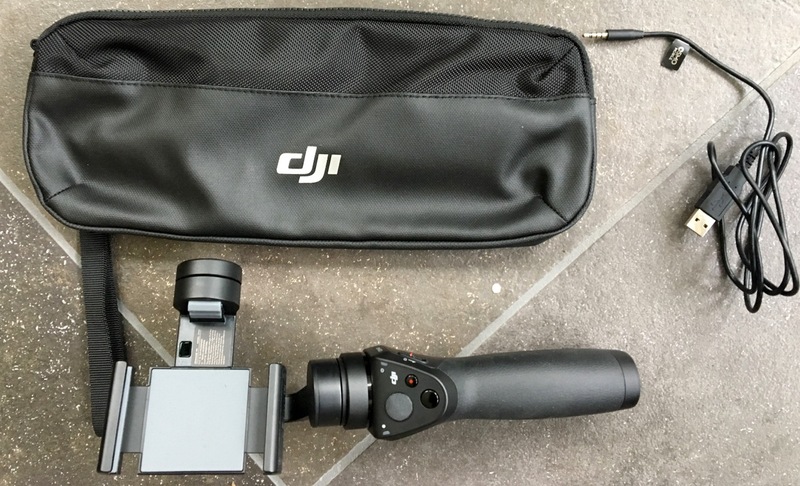 However, keeping that price point means that DJI had to leave out some goodies. Specifically, the case is thin and a poor fit and the battery-charging USB cord may present some problems (we are having some charging issues with ours – more on that later). Those who need more reliability and flexibility should order the external Osmo charger as well as another battery. Note – Droneflyers.com is a participant in various “affiliate” programs including Amazon, DJI, Banggood and others. We make a small commission when you purchase an item using our links. We purchase most of our own equipment for reviews at regular retail price (like you do!). Below is a link to Amazon for the same product.